Recently, our Swedish member Stockholm City Mission has been awarded for its social enterprise “Remake”. 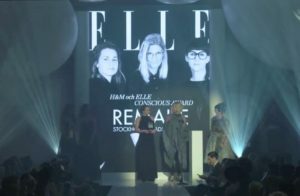 Our member won the “Sustainability Prize” awarded by the fashion brand H&M and the magazine ELLE. The ceremony took place at the ELLE gala on the 18th of January in Stockholm. In awarding one of the first prizes to Stockholm City Mission Remake, the jury stressed the social enterprise’s commitment to social inclusion and sustainability. The price was retired by Stockholm City Mission Operations Manager Maria Lagerman, and the designers Marie Teike and Karin Sterner. “Remake” is one of the social enterprises run by Stockholm City Mission. The project gives people the opportunity to gain access or find a way back to employment for people with low employability and higher support needs. Participants at last November’s Access to Employment network meeting in Stockholm had the chance to discover the work carried out by “Remake” and other social enterprises of the Stockholm City Mission. To know more about our last Access to Employment network meeting in Stockholm, please read the meeting report. To know more about Remake, please visit Stockholm City Mission website.